The Vozrozhdenie Theater Company is a world-famous supplier of theatrical supples, special effects equipment, and dance costumes for stage performances. The company is situated in St. Petersburg, Russia in the very heart of the theatrical district. Looking through the official website of this famous company, one can really see the rich history and experience this company has with producing the finest displays of theatrical showmanship. 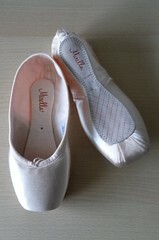 My greatest interest was in the Vozrozhdenie pointe shoe model. 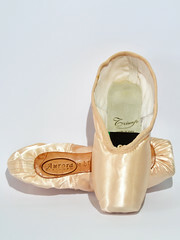 I was slightly disappointed that Vozrozhdenie only shows the tiniest photo of their pointe shoe model. There is no information given about the shoe at all. 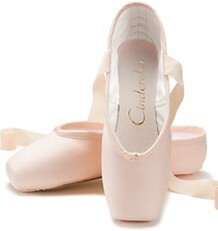 According to the website, their pointe shoes are custom-made as needed. 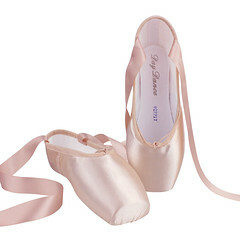 I would love to find a large photo of the Vozrozhdenie pointe shoe. The Vozrozhdenie website can be viewed in an English version which is nice. 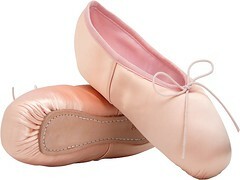 To find out more about this great company and to see the photo of the Vozrozhdenie pointe shoe visit their official website, Theater-decor.com. 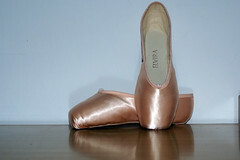 This entry was posted in Russian Brands and tagged Vozrozhedenie pointe shoes. Bookmark the permalink. Hi, I’m not sure where to leave this comment but a Russan shoe brand seems appropriate. I stopped by the Boston International Antiquarian Book Fair today, one seller of musical/theatrical memorabilia had a pair of Maya Plisetskaya’s pointe shoes. At $1200 they were WAY out of my price range, but I did get to handle and touch them! The soles and insides were rather worn so I couldn’t identify any brand or maker’s name. The top of the sole was squared off, which I believe is a Russian feature. Maya had sewn together the opening of the vamps with some thick pink threads to make the throats into deep Vs.
Maya Plisetskaya was a breathtaking dancer; one of world’s best. 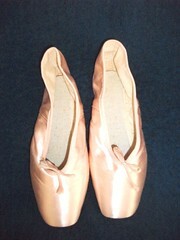 To view and touch her old pointe shoes must have been absolutely divine.